A riff is a short rhythmic phrase that is repeated several times. Other similar concepts are the ostinato and the Motif! Theme, terms that are sometimes used interchangeably. A riff brings additional excitement to a soloist’s improvisation. Very often the riff becomes an integral part of a tune. If you listen to some of the early Jazz/Swing bands, you would probably encounter some very powerful riffs. A riff may be played by a horn/brass/reed section, piano player, etc. What we will address here is how a drummer can enhance a riff. The idea is to take a theme and elaborate (customize) it rhythmically. This is one of the most useful skills a drummer can acquire – the ability to take a musical statement (theme – motif – ostinato – riff) and “rework” it into an appropriate and imaginative drum variation. This lends itself to a more musical contribution by the drummer. Great players are very crafty and highly creative individuals – anything we can do to help ourselves in the learning process should be utilized. This is not a drum “method” book, per say. It is designed to encourage the reader(s) to become more interactive. Each player is asked to contribute to the process. It is intended for players who enjoy some additional challenges in their studies. 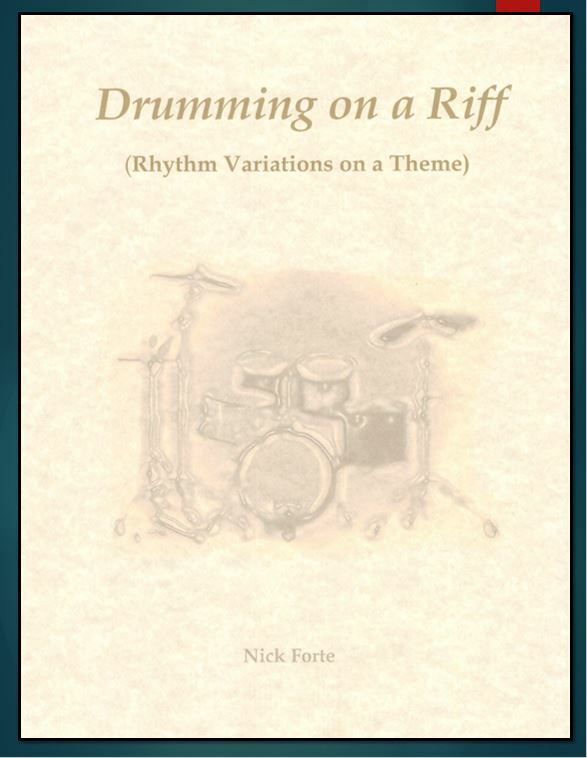 (If “basic” drumming skills are needed, I would recommend my six-book drum course “Drumming – Step by Step” described on the “Forte Publications” page at the end of the book.) “Drumming on a Riff’ begins with twelve “core” rhythms. Each rhythm is a two-bar riff. Each of these riffs is followed by twelve ”variations” on that riff. Intermingled between these pages are “workbook” pages where the drummer may write out his/her own variations of other “suggested” motifs/themes. Additional to this, it is possible (and recommended) to construct independent snare studies by combining some of the variations that you composed on your workbook pages. An example of this is located at the end of the book. (One of the fun things I do with some of the students is to have them pick any measure of any snare page, and I make a drumset fill or solo out of that measure – in a rock, jazz or Latin style . I do this to show how important good reading and improvisational skill is and how snare studies (single-line rhythms) can be applied to the drumset.) I have included examples of this idea (taken directly from the core groups) to develop drumset rock and jazz grooves. Since new material is easier to learn when it is “heard,” I have included an audio CD. This CD was created using midi technology with professional quality sound samples. A major benefit in utilizing this technology is the high degree of exactness attainable in tempo and timing of each example – think of it as a very sophisticated click track or Metronome!